You might not expect the United States Patent and Trademark Office to be as excited about the Winter Olympics as it is. But this month, office is releasing historic patents that reveal how winter sports emerged. So, who invented the snowboard? The USPTO's Winter Games Intellectual Protection madness will continue until the Olympics end later this month. 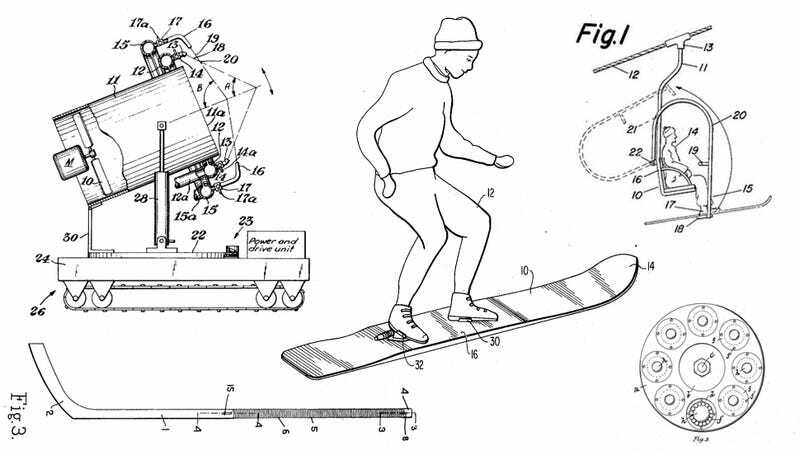 But in the meantime, I went digging through its archives for other patents involving winter sports—and begged the USPTO's Paul Fucito to send us a few more. It turns out that the Winter Games are an interesting mix of old and new: A patchwork of ancient tools—like skis—and hyper-modern, emerging technologies—like parabolic skis. Here's what we found. "Little did I know growing up that my dad's invention would take off and become an Olympic sport with such a following," his son recently commented. There were also ideas that didn't catch—like this 1915 patent for a hockey stick with a hidden function. Its handle hid a detachable rope that could be thrown to players who broke through the ice. Skis are ancient inventions—they've been used in cold climates since we first figured out how to tie bark to our feet to move over deep snow packs. But our modern idea of skiing as a sport? That emerged in the late 19th century. For example slalom—or slalåm—was first raced in 1905, in Sweden. What about the ice skaters? A patent for a ice resurfacing machine—aka a Zamboni—was awarded to the eponymous Frank was awarded the patent in 1953. By the 1960s, Zamboni had invented a model using an auto chassis. "Said game [is] well understood," said Hamilton, who presumably had never pondered curling on a metaphysical level. But it's Wayne Pierce, a Connecticut inventor, who is widely cited as the inventor of the contemporary snow maker—or, at the very least, the first entrepreneur to patent one. He and his co-inventors tested their first model in 1952 at the Grossinger's Catskill Resort Hotel, the first ski hill to do so. The USPTO points out this design for a torch, which was patented in 1893, just three years before the first modern games. While it's not specific to winter—or even the Olympics—it's an unusually beautiful drawing for a patent. Its inventor—Connecticut man Frederick Rockwell—described them as "deconstructable pyrotechnicolor illuminating torches:"
Is there anything we're missing? Let us know in the comments. In the meantime, check out the USPTO's coverage here.